Create your own pressed flowers to adorn cards and stationary using the BestNest Nature Press. Pressing flowers, leaves, and herbs is a great project to help your children become interested in the natural world, and adds a designer touch to ordinary objects. This convenient press is just the right size for small flowers or leaves, and the nine sheets of corrugated cardboard allow several items to be pressed at once. Adjustable wing nuts on the screws in each corner may be tightened as needed, flattening the plants as they dry. The included blotting paper helps the plants dry properly, for vibrant results. Plastic feet on the base of the press allow it to rest on a table without scuffing it. The sturdy MDF top and bottom have a basswood veneer, for a natural look on the unit. 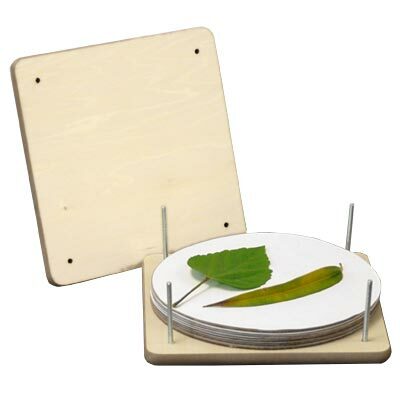 Add a new element to flower and leaf collecting with this Nature Press.